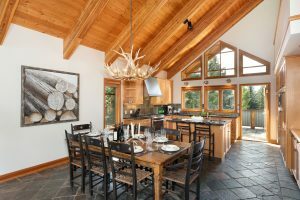 Whistler Home Series: Kitchen Style - Whistler Real Estate Ltd. 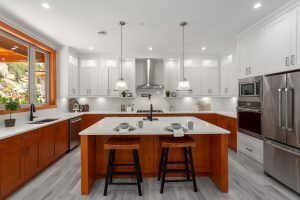 The kitchen is considered the heart of any home, it is the place where family and friends gather to cook, dine and socialize. A kitchen can express a particular personality and you certainly don’t have to be a top chef to have an amazing kitchen. Different kitchens suit different styles, needs and home owners’ individuality. 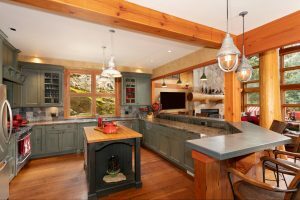 With that in mind, let’s take a look at different styles of Whistler kitchens for passionate and not so passionate cooks. A Gourmet Chef’s Kitchen is designed with careful detail for cooks who use the finest tools and ingredients to create culinary masterpieces. From the kitchen layout to the choice of appliances, this kitchen endeavours to enhance a chef’s food preparation abilities. This type of kitchen will have storage in organized abundance and ample counter space. 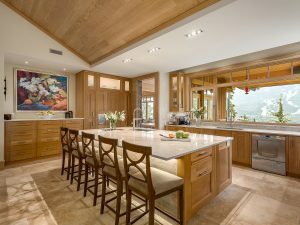 The addition of an island in a gourmet kitchen offers more flow and storage space for a chef. The type of countertop is carefully taken into consideration as the kitchen is designed for heavy use. The materials are carefully chosen to withstand endless amounts of spilling, staining, slicing and dicing. A good small kitchen should offer clever storage, ideally with wrap-around shelving at ceiling height. This use of vertical space draws the eye upward and makes the small space feel larger. When it comes to decorating a small space, less is more; however, that isn’t to say you shouldn’t utilize extra space. Allow open shelving to showcase kitchenware or introduce a pop of colour with a colourful wallpaper or backsplash. From compost bins to lighting and countertops, there are many ways to make your kitchen a more eco-conscious space. When choosing appliances and lighting fixtures it’s important to be aware of the Energy Star rating to maximize efficiency. For example, an efficient dishwasher will use less water than you would use when washing dishes by hand. Having a smaller refrigerator is also a great way to use less energy and ensure you buy less produce that can often go to waste. A wonderful addition to any kitchen are small planters with indoor herbs such as rosemary or basil. This offers fresh herbs to the cook and also improves the air quality of the room. Shopping local for your kitchen accessories is a good way to cut out the environmental and financial cost of worldwide shipping. 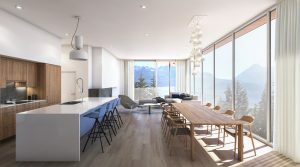 In Whistler, we are lucky to have very creative craftsmen and you can find excellent pieces for your home in many local shops. Many local events (such as the Sunday Farmers market during Summer or the Whistler Holiday Market in November) are great places to pick up hand crafted local items to accessorize your kitchen. The minimalist movement has been a popular design style since the 1950’s and can take many forms. The key features of a minimalist style is to achieve better design through simplicity of material, object and space. Minimalist kitchens aim to keep things simple with clean lines and sharp corners, and with a focus on neutral tones such as white or gray. A minimalist kitchen design will often have integrated appliances to ensure the room is complimented. The appliances will have a neutral or stainless steel finish on them or be fitted into neat cupboards. A minimalist design will ensure a practical benefit to any cook as everything has its own place with no clutter. This style of kitchen is sleek yet functional, and never boring. A good family kitchen must have a detailed oriented approach to make sure the flow and design makes life easier for a family. The kitchen is where many families spend a large part of their time so it’s important to ensure the kitchen is comfortable, efficient and easy to clean. The family kitchen should have a warm and inviting feel to it with lots of space and good use of light. An island is a great addition to a family kitchen as it allows for extra storage while also offering extra workspace for the entire family. 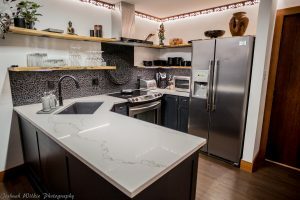 As every family is unique, the family kitchen should facilitate the family’s needs while also reflecting their style. If you’re thinking of remodelling your, kitchen speak to an expert to plan the right kitchen for your needs.